I am passionate about original art, so no surprise that I think it makes a wonderful gift. Year after year, small paintings always sell extremely well in the Quatrefoil Design store during the holiday times. Art makes the perfect gift – each painting is an original, and is truly one of a kind. There are so many different ways to display small artwork in the home. We are shipping until Wednesday, December 19th, so it is not too late to get that extra special piece of art for someone special on your list! 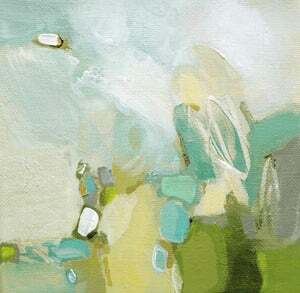 Melissa Payne Baker’s art has been in the Quatrefoil Design store for years. I love how versatile small pieces of art can be, to make a special spot come alive. (Photo credit Emily Followill). I particularly like using small pieces of art to balance out bookshelves. Many of my customers display art on side tables or chests. Charming 3”x3” Itty Bitty paintings – can hang anywhere (on the bulletin board, on a knob, on a window latch). 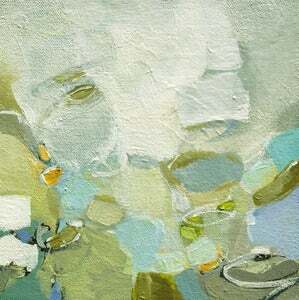 We still have a good selection of the lovely Lisa Moore paintings available. 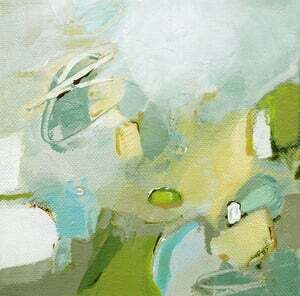 We have a small selection of original Christina Baker paintings available. 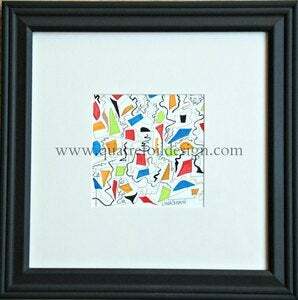 New to the store in 2012 is a collection of whimsical and charming abstract pencil and watercolor sketches. These paintings are favorites of top Atlanta designers and work so well as part of gallery walls or as striking collections. I have some of these beautiful sketches in my library bookshelves, displayed in pairs. We still have some wonderful Jennifer Ferris paintings available. We have a group of 7 beautiful custom framed intaglios, in our signature gilver finish frame, available for immediate shipment. This is a special collection and will only be available this month. Finally, we have a gorgeous new set of 22 framed blue agates available for immediate shipment. Since I first posted on these, I have not been able to keep them in the store – they sell immediately, even before I put them in the store. This group of framed agates are particularly beautiful – the blues are primarily sapphire, but given the nature of the agates, vary from sapphire to blue to teal, some with touches of taupe or beautifully crystaline structures. They are large size agates, so they we framed them larger, 14”x18”. They are stunning! Click on individual picture to go to store item, or visit http://quatrefoildesign.bigcartel.com/category/agates to see framed agates currently in stock. Agates are creations of nature, and are one of a kind. This is what makes them so special and unique. As a natural stone with crystalline structure, it is often difficult to capture in a photograph the variety and richness of color and grain pattern that is evident to the naked eye. Flash photographs capture the brilliance of color and the special way in which the agates interact with light, but at times make the colors appear more saturated than they appear to the naked eye. Please carefully read the color description of the agate in each item listing, and do not hesitate to emailquatrefoildesign@gmail.com if you would like additional information and pictures. I love little paintings. Tiny paintings. They beckon to me. I like taking my glasses off and getting up nose to nose with them - stepping inside them. We have loved carrying art over the years and I totally agree about those small pieces making a certain spot come alive! Melissa's work is wonderful and we are also loving it as our latest addition to our artists. They indeed do make wonderful gifts! Hope your weekend is wonderful! Art is the Answer Holly! A wonderful selection! Love those small paintings with the books or on a side table. Such gorgeous colors. Thanks for the introduction and I'll check out some of the links! i am so with you about the original art, holly. your images prove what a moving statement a small piece can make. so inspiring. So beautiful, Holly! All of those would look divine in a traditional, transitional or modern setting. My favorite way of displaying small artwork is with an invisible high-quality acrylic stand. I love art everywhere especially lovely small pieces if art as accessories! These are wonderful choices, one lovelier than the next! I especially love the agate!! They are so sharp, will keep in mind for next project for sure! !